When it comes to choosing track hardware for your sliding closet doors the main decision is really about how many individual doors do you want on each track. 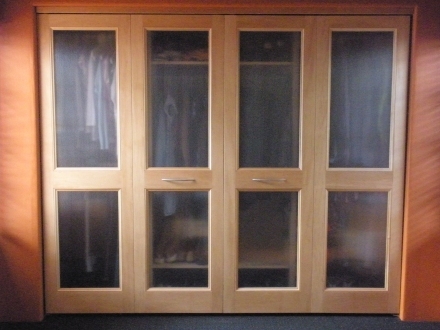 Your options vary somewhat depending on whether you are going with 2, 3 or 4 sliding doors to cover your closet. If you have 2 doors covering your closet then you have a choice of a 2 track system or a wall mount system. With the standard 2 track system (figure 1) the doors slide back and forth within the opening so you can access half of your closet at any one time. With the wall mount (figure 2) you have full access to the closet however you need to have clear wall space for the doors to slide. With 3 doors covering your closet you can choose either a 2 track or 3 track system. With the 2 track system (figure 3) you will have 1 door on 1 track and 2 doors on the other track. This means that you can only open up one third of your closet at any time. With the 3 track system (figure 4) each door has its own track so that you can slide and stack all 3 doors one behind the other. This allows you access to two thirds of the closet. Something to keep in mind is that if you go with a 3 track system you need to have enough depth in your header to hold all 3 doors. A standard wall built with 2x4s and a 4.1/2″+ jamb header is deep enough to accommodate 3 doors 1.1/4″ or 1.3/8″ thick. If you are using 1.3/4″ doors you will need a jamb header at least 5.1/2″ deep. For 4 doors the most common layout that we see is a 2 track system (figure 5) with 2 doors on each track. This allows for half of the closet to be open at a time. The alternative is to have each door on its own track (figure 6). This would give you the most access to your closet however you will need to have walls built with 2×6 studs as a minimum. Do you need a Bottom Track? The commercial grade sliding door hardware that we offer is designed so that all of the weight is supported at the top. This means that a bottom track is used only to guide the doors and keep them from swinging front to back. On the standard 2 track system the bottom track is optional. You would really only need the bottom track if you are concerned about the doors being pushed front to back like you might have in certain commercial applications or if you had large pets. On sliding closet doors systems with 3 or more tracks a bottom guide track is already included. Which Track Hardware is best for your Sliding Closet Doors? If you are still not sure which sliding closet door hardware will work for you let us help. Give us a call, send us an email or start an online chat. We are happy to help. How Thick Should My Interior Doors and Closet Doors Be Made? Here at Kestrel we make our custom sized interior doors and closet doors in three standard thicknesses; 1.1/4″, 1.3/8″ and 1.3/4″. Since we build all of our doors from solid wood using pegged, mortise and tenon joinery, the doors will be very sturdy regardless of the thickness. 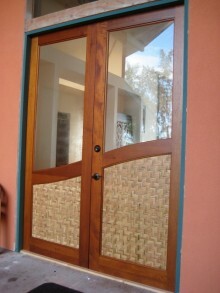 However, a thicker door will have added stability which is something to consider if you need over-sized doors. For most doors the main reason why you might choose one thickness over another is usually the hardware. We sell different levels of track hardware with our pocket doors that can handle interior doors ranging from 3/4″ thick all the way up to 3″ thick. In most cases our standard 1.1/4″ thick doors will be what you want for your pocket doors. However, If you plan to add an optional pocket door lock you will need to go with 1.3/8″ or 1.3/4″ thick doors as the lock requires the extra thickness. While there are hinges for any thickness of interior door most available double-sided handles and lock sets require interior doors that are 1.3/8″ or 1.3/4″ thick. It is best to choose your lock sets and handles first so that your doors can be made thicker if needed. If you plan to use a handle on one side of your doors only then 1.1/4″ will be thick enough. The heavy duty, commercial grade track hardware we sell for bifold doors and sliding closet doors will work with individual doors ranging from 1.1/8″ up to 1.3/4″ thick. Almost all of the bifold doors and sliding doors that we make are 1.1/4″ since they rarely need a lock. If you are planning to add a lock we would recommend choosing that first in case you did need thicker doors. Beyond over-sized doors and the hardware there are a few other things to think about when it comes to the thickness of your doors. Will the doors be taking a fair amount of abuse like you might see in a public location? Do you want the look of your louvered doors to have more depth to them? Are you planning on using insulated glass in your doors? These are some of the other reasons why you may want to go with thicker doors. If you are still not sure please ask and we will work with you to find what thickness is best for your doors. Interior doors of any style can be mounted as a sliding closet doors; all that it takes is the correct type of sliding door hardware! How do you plan to use your Sliding Closet Doors? Before we look at any of the options you want to take a moment and really think about how you will be using your sliding doors. Are they for a closet or utility room, a free-standing wardrobe or will the doors be separating two living spaces? Will you be opening them every day or just once in a blue moon? When you do open the doors will you need them to slide far enough apart to remove a heat pump or just wide enough to grab a clean pair of socks? Will it only be you using these doors or will it be your kids or will the doors be used in a public space? Knowing how you will use your sliding doors will help you in deciding which type of sliding door hardware will best suit your needs. Tilt In OR Top Latch? This is referring to how the doors get installed on to the track. Lighter weight sliding door hardware is designed so that you can just tilt the door at an angle and have the rollers catch on to the track. Unfortunately the opposite is also true meaning that all you (or your children or large pets) have to do is knock the door up and at an angle a bit to have the door come off the track. For this reason we do not even offer this kind of hardware. Instead we use commercial grade Johnson hardware that has a latch system (shown at left). The wheels have a post hanging straight down that slips in to a bracket on the top edge of the door. This bracket has a white latch that closes and secures the door to the wheels. This not only makes for a much safer design but it also makes it easy to remove the doors if you should ever need to pull something very large out from behind the doors. Do you want a Bottom Guide Track? Most high end sliding track hardware is designed so that the full weight of the door is supported by the top track and hangers. This makes it easier for the doors to slide back and forth and reduces stress on the door. Because of this some sliding door hardware will only need the simple door guide shown to the right. This is installed on the floor where one door overlaps the next. This guide prevents the doors from swinging front to back. Optionally, you can replace this guide with a full guide track. These are little ” U ” channels that mount onto or into your floor. The full guide track is helpful if you are concerned about a lot of force pushing the doors back and forth like you might have with children, large pets or commercial applications. For sliding door hardware with more than 2 tracks and for very heavy doors the bottom guide track is a standard to remove the chance of doors swaying front to back. Where would you like the Doors to Slide? When it comes to sliding door hardware there are 3 places where the doors can slide. Option 1. The doors can slide back inside the walls. These are called Pocket Doors. Pocket doors are nice in that they can slide completely out of the way to allow full access to the closet. They are also great where full swing doors do not have room such as in a kitchenette area. The down side is that if you are retro-fitting an opening you will need to rip out the walls so that you can install the hidden tracks but for new construction preplanning a pocket door is easy. Option 2. The doors can slide along the face of the wall like barn doors. These use wall mounted sliding door hardware. Like the pocket doors these will offer you full access to your closet. However, keep in mind that anything mounted to your walls, like shelves or light fixtures, will need to be removed so that the doors can slide. Option 3. The third way, which is the most common style of sliding door hardware, is where the doors can slide back and forth within the opening. Since the doors stay within the opening this means you will not have full access unless you remove the doors. This is the most popular style we see utitilized and what we quote as a standard. If you will need full access on a daily basis then pocket doors or wall mounted sliding doors (options #1 and #2 above) will be your best options. If you will not need full access other than a once a year spring cleaning then the standard sldiing doors (options #3 above) will work fine. How Many Sliding Door Tracks would you like? 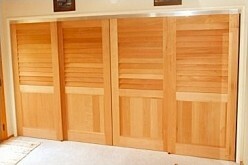 In many closets you will see 2,3 or 4 sliding doors. Often the doors are mounted on 2 tracks, one in front of the other. When there are 2 doors in the opening this means that 1 of the doors can slide behind the other to give you access to either the left or right half of the closet. (see Figure A below) With 4 doors on tracks (as shown in option #3 above), you also have the option of sliding the doors to the edges so that you have access to the center of the closet. (see Figure B below) With 3 doors on 2 tracks there is the problem that access is only to a third of the closet at any one time. (see Figure C below) One way around this is to have each door be on its own track. This allows the doors to slide anywhere within the opening and be stacked together, one behind the others. (see Figure D below) For 3 or more tracks you will need enough depth on the header to allow you to mount the multiple tracks. If your opening does not have enough depth you can always mount a wide, solid piece of wood as a new header. 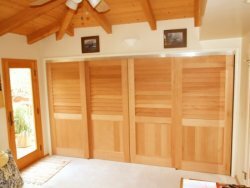 Regardless of how you will be using or installing your sliding closet doors there are things to consider when it comes to the type of sliding door hardware. If it does get a bit confusing please do not hesitate to contact us be it email, phone call or live chat. 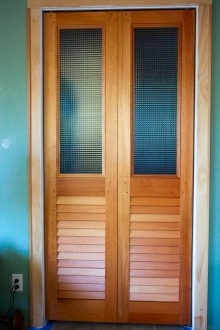 Looking for a simple way to personalize your interior doors? Our 6500 series interior doors feature removable trim which can be used to hold glass, mirrors and most any other flat panel from dry eraser board to woven reeds. We can supply you with clear and frosted tempered glass. Pantries, bedrooms and closets alike, even exterior entrance doors, can have a glass or plastic glazing insert. Glass inserts add an interesting transition from room to room even if it is a closet. Natural light softly illuminates this closet's storage area. A double walled poly material provides the subtle opaque quality in these bi-fold doors. For this combination medicine and linen closet the homeowner used a heavy banded glass which is perfect for providing just a hint of what is kept on the shelf behind the door. With the louvered door section below linens will have adequate ventilation to stay fresh. Here On this bi-fold door combination, custom Art’s & Craft style stained glass inserts were used to give these tongue & groove doors a very unique look. Here the homeowner chose a frosted glass with a pattern of dots. 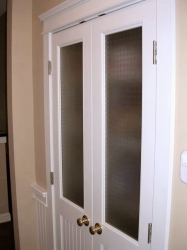 The glass sits above a true beadboard panel in this double door closet installation. Here this customer on the Hawaiian Islands did not want to block the view outside their front door so they went with clear tempered glass for the top and a woven insert for the bottom. The mid-rails on these door frames were custom shaped to mimic an ocean wave. With a Kestrel 6500 door series glass, mirrors, poly-wall and any other sheet material is a snap to install. 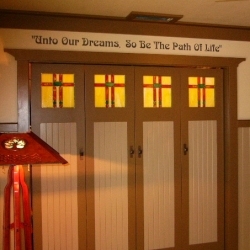 With so many door frame insert possibilities personalizing your door’s becomes very easy. A common misconception is that closet door hardware, especially hardware for sliding closet doors, require a bottom track. The belief is that the bottom track helps support the weight of the doors as well as keep the doors aligned. The Johnson Hardware we supply with our closet doors is actually designed to support the entire weight of the doors at the top. The rollers are all sets of 3 or 4 wheels that have been machine turned and balanced. This means that the optional bottom track is used only to help guide your sliding closet doors and bifold doors. When should I use a bottom track? You really only need to use the bottom guide when there is a concern that the doors might be bumped hard enough to swing back and forth. Some good examples would be if the doors are being be used between rooms or if you have small children or large pets. Are bottom tracks only for sliding closet doors? No. Larger bi-fold doors are also good candidates for a bottom guide track. Follow the same rule as with your sliding closet doors. If you think your bi-fold doors are going to be bumped a lot then a bottom guide track might be helpful. Do I need to cut into my floor to install the bottom track? No. Since the bottom guide tracks do not support any weight they can be surface mounted to your floor. Wood strips can be placed on either side of the track to give the look of a finished threshold. If you have not installed your floor you can also use a bottom guide track. In this case you would simply install your flooring on either side of the bottom guide track. The nice thing about this method is that the track is submerged below the floor level so there is no concern about tripping. So while a bottom track is not needed to support the weight or your doors, it can help to guide your doors.